Harbor seal numbers were severely reduced in Puget Sound during the first half of the twentieth century by a state-financed population control program. This bounty program ceased in 1960, and in 1972, harbor seals became protected under the federal Marine Mammal Protection Act and by Washington State. Harbor seal (Phoca vitulina). Photo by Peter Davis for the U.S. Fish and Wildlife Service. Harbor seals (Phoca vitulina) are found throughout temperate and arctic waters of the northern hemisphere, and inhabit coastal and estuarine waters along the eastern Pacific Ocean from Baja California north to the Gulf of Alaska and Bering Sea (Carretta et al. 2004, Carretta et al. 2007) . Harbor seals are found throughout the nearshore waters of Washington including Hood Canal, Puget Sound, the San Juan Islands, and the Strait of Juan de Fuca out to Cape Flattery (Jeffries et al. 2003) (Figure 1). They use hundreds of locations in Puget Sound to haul out or rest, including intertidal rocks, reefs, and beaches, logbooms, docks and floats. Harbor seals in Washington are considered non-migratory and display strong fidelity to haulout sites. Their local movements are associated with tidal cycles, time of day, weather, and prey availability (Zamon 2001, Carretta et al. 2004, Hayward et al. 2005, Carretta et al. 2007, Patterson and Acevedo-Gutierrez 2008). Most individuals in the inland waters forage in close proximity to haulout sites, and return to the same areas for foraging and haulout (Lance and Jeffries 2006). In general, harbor seals forage opportunistically on prey that are locally and seasonally abundant(Lance and Jeffries 2006, 2007). Figure 1. Map of harbor seal haulout sites and survey regions for Washington. The inland stock includes the Strait of Juan de Fuca (3), San Juan Islands (4), Eastern Bays (5), Puget Sound (6), and Hood Canal (7) (reprinted with permission from Jeffries et al. 2003). Threats to harbor seals include incidental takes from drift gillnet fisheries, vessel strikes, and contaminants. Harbor seals are vulnerable to contamination by persistent organic pollutants (POPs) because they are long-lived, occupy a high trophic level, and have limited metabolic capacity to eliminate pollutants (Ross et al. 2004). Exposure to contaminants has also been associated with immunotoxicity and outbreaks of infectious disease (Mos et al. 2006). Harbor seals in Puget Sound are also heavily contaminated with polychlorinated biphenyls (PCBs) and polybrominated diphenyl ethers (PBDEs) (Simms et al. 2000, Ross et al. 2004, Cullon et al. 2005). Harbor seal numbers were severely reduced during the first half of the twentieth century by a state-financed population control program. This bounty program ceased in 1960, and in 1972, harbor seals became protected under the federal Marine Mammal Protection Act (MMPA) and by Washington State. Based on morphological, phenological and genetic differences, the coastal and inland populations of Washing are considered to be two different stocks (Carretta et al. 2007). Currently, both the inland and coastal stocks of harbor seals are not considered “depleted” under the MMPA or listed as “threatened” or “endangered” under the ESA. Population count data collected using aerial surveys of haulouts conducted by WDFW in 1999 indicate both stocks to be within their Optimum Sustainable Population (OSP) ranges as defined by Jeffries et al. (2003). It is estimated that 2,000-3,000 harbor seals resided in Washington in the early 1970s (Newby 1973), and historic population levels prior to this are unknown. Beginning in 1983, WDFW initiated consistent aerial surveys of harbor seal inland waters population, which continued through 1999. Jeffries et al. 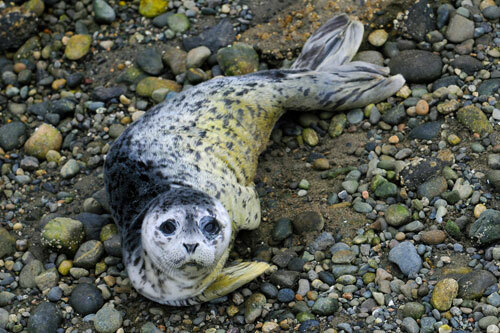 (2003) found that during 1999, Washington inland stock contained 13, 692 seals and that both the coastal and inland populations were near carrying capacity (Figure 2). Thus, at the population levels of 1999, Jeffries et al. (2003) estimated that Washington State harbor seal populations could withstand significant declines and still be within the Optimum Sustainable Population levels. The 1999 population count continues to be the most recent estimate of Washington harbor seal abundances (Carretta et al. 2007). Figure 2. Generalized logistic growth curve of aerial counts of harbor seals in inland waters of Washington (includes the Strait of Juan de Fuca, East Bays, San Juan Islands, Hood Canal, and Puget Sound regions) (reprinted with permission from Jeffries et al. 2003). Harbor seal abundance estimates are based on aerial surveys of maximum haul-out counts, which can be complicated by spatial and temporal variability in the behavior of the seals and in the proportion of individuals that are observable (i.e., onshore) during sampling events. To address uncertainty in the proportion onshore, current estimates of trends and population abundances (Jeffries et al. 2003) use both a static correction factor developed by Huber et al. (2001) and an observation-error time series model fitting using maximum likelihood techniques to estimate population dynamic model parameters. To address variability in seal behavior, Hayward et al. (2005) suggest an environmentally dynamic modeling approach, but this has not been adopted. The impacts of contaminant exposure on population status are not well known. Harbor seals populations in Washington State have recovered since the 1970s and population sizes may be near a stable equilibrium level, perhaps reflective of the current carrying capacity of the environment. Because of their high trophic position, harbor seal contaminant loads may be used as indicators of pollution levels in Puget Sound (Ross et al. 2004), and have been suggested as possible indicators of other types of anthropogenic change (climate change, fishing activities) (Hindell et al. 2003) and fish community composition (Lance and Jeffries 2007). Carretta, J. V., K. A. Forney, M. M. Muto, J. Barlow, J. Baker, B. Hanson, and M. Lowry. 2007. United States marine mammal stock assessments: 2006. National Marine Fisheries Service, La Jolla, CA. Carretta, J. V., K. A. Forney, M. M. Muto, J. Barlow, J. Baker, and M. Lowry. 2004. U.S. Pacific Marine Mammal Stock Assessments: 2003. NOAA Technical Memorandum NMFS-SWFSC-358. Cullon, D. L., S. J. Jeffries, and P. S. Ross. 2005. Persistent organic pollutants in the diet of harbor seals (Phoca vitulina) inhabiting Puget Sound, Washington (USA), and the Strait of Georgia, British Columbia (Canada): A food basket approach. Environmental Toxicology and Chemistry 24:2562-2572. Hayward, J., S. M. Henson, C. J. Logan, C. R. Parris, M. W. Meyer, and B. Dennis. 2005. Predicting numbers of hauled-out harbour seals: a mathematical model. Journal of Applied Ecology 42:108-117. Hindell, M. A., C. J. A. Bradshaw, R. G. Harcourt, and C. Guinet. 2003. Ecosystem monitoring: Are seals a potential tool for monitoring change in marine systems? Page 446 in N. Gales, M. Hindell, and R. Kirkwood, editors. Marine mammals: fisheries, tourism, and management issues. CSIRO, Collingwood, VIC. Huber, H. R., S. J. Jeffries, R. F. Brown, R. L. DeLong, and G. VanBlaricom. 2001. Correcting aerial survey counts of harbor seals (Phoca vitulina richardsi) in Washington and Oregon. Marine Mammal Science 17:276-293. Jeffries, S., H. Huber, J. Calambokidis, and J. Laake. 2003. Trends and status of harbor seals in Washington state: 1978-1999. Journal of Wildlife Management 67:207-218. Lance, M. M., and S. J. Jeffries. 2006. Estimating importance of rockfish, lingcod and other bottomfish in the diet of harbor seals in the San Juan Islands. Page 20. Contract Report to SeaDoc Society, Olympia. Lance, M. M., and S. J. Jeffries. 2007. 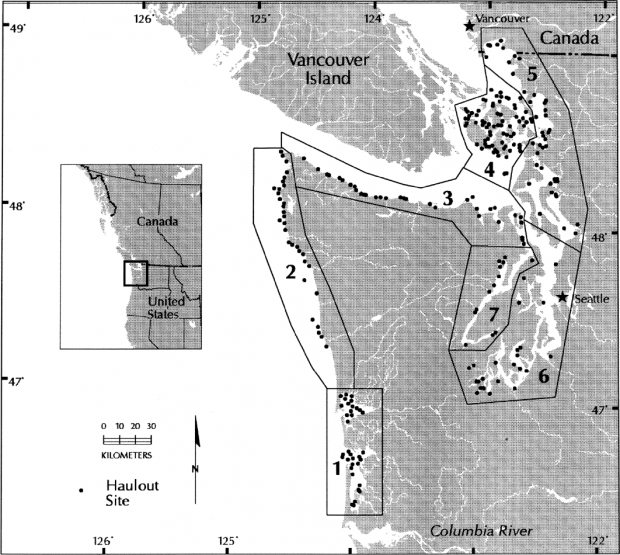 Temporal and spatial variability of harbor seal diet in the San Juan Island archipelago. Research Agreement No. K004431-25, Contract report to SEAdoc society research agreement NO. K004431-25. Washington Department of Fish and Wildlife, Olympia, WA. Mos, L., B. Morsey, S. J. Jeffries, M. B. Yunker, S. Raverty, S. De Guise, and P. S. Ross. 2006. Chemical and biological pollution contribute to the immunological profiles of free-ranging harbor seals. Environmental Toxicology and Chemistry 25:3110-3117. Newby, T. C. 1973. Changes in Washington State harbor seal population, 1942-1972. Murrelet 54:5-6. Patterson, J., and A. Acevedo-Gutierrez. 2008. Tidal influence on the haul-out behavior of harbor seals (Phoca vitulina) at a site available at all tide levels. Northwestern Naturalist 89:17-23. Ross, P. S., S. J. Jeffries, M. B. Yunker, R. F. Addison, M. G. Ikonomou, and J. C. Calambokidis. 2004. Harbor seals (Phoca vitulina) in British Columbia, Canada, and Washington State, USA, reveal a combination of local and global polychlorinated biphenyl, dioxin, and furan signals. Environmental Toxicology and Chemistry 23:157-165. Simms, W., S. Jeffries, M. Ikonomou, and P. S. Ross. 2000. Contaminant-related disruption of vitamin A dynamics in free-ranging harbor seal (Phoca vitulina) pups from British Columbia, Canada, and Washington State, USA. Environmental Toxicology and Chemistry 19:2844-2849. Zamon, J. E. 2001. Seal predation on salmon and forage fish schools as a function of tidal currents in the San Juan Islands, Washington, USA. Fisheries Oceanography 10:353-366.